Striped skunk (Mephistis mephistis), Montana. Photo by Dan & Lin Dzurisin, Creative Commons License. White stripe on back splits to form a “V” around tail. Tail is bushy and black, sometimes with a few white hairs. Little data exists on the distribution of Striped skunks along the Truckee River, so if you see one, please record an observation! A smaller species of skunk, the Spotted skunk (Spilogale gracilis) may also be present in the region (Orr 1949). To identify a Striped skunk, just look for a stripe of white. On the Spotted skunk, look for…you know…spots. The Striped skunk’s species name, Mephistis mephistis, comes from the Latin word mephit, for “bad odor.” Armed with the ability to spray a potent yellow musk from their hind-ends, skunk presence is sometimes easier to detect with your nose than your eyes. Striped skunk are not aggressive, but use musk as a powerful form of self-defense, able to spray to a distance of almost 20-feet. The musk, in addition to carrying a terrible smell, can irritate the eyes and sicken predators who come too close. Most mammals avoid preying on the skunk for this reason, but birds like the Great Horned Owl don’t seem to mind (Wade-Smith & Verts 1982). Striped skunks are mostly nocturnal and frequently seen around dusk, except during winter when they retreat to underground dens. They breed during February and March (Wade-Smith & Verts 1982), and give birth during April, May and June to litters of 2 to 9 young (usually 5) (Orr 1949). The female skunk and her offspring stay together for 3-5 months, usually until fall (Wade-Smith & Verts 1982). Striped skunk eat mostly insects, but are omnivorous and may feed on mice, voles and fruit during certain times of year (Wade-Smith & Verts 1982). 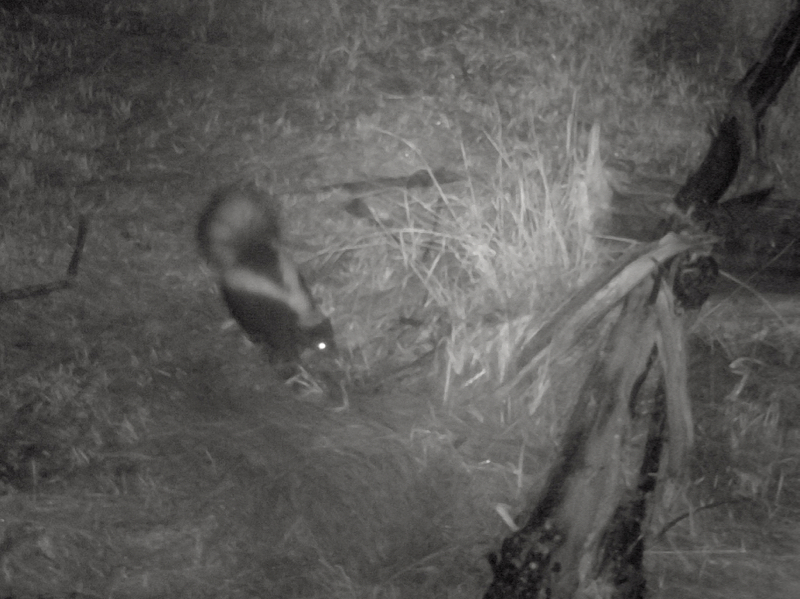 Striped Skunk at Oxbow Nature Study Area, Feb 28, 2015. Photo credit: Scott Huber, Reno High School. Orr, Robert T. 1949. Mammals of Lake Tahoe. San Francisco, CA: California Academy of Sciences. Wade-Smith, Julia and B.J. Verts. 1982. Mephitis mephitis. American Society of Mammalogists, No. 173, pp.1-7. 25 May 1982.